We had a few days camping at the forest headquarters in the Mangawhai forest, on the east coast of Northland. 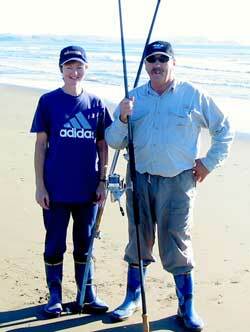 We fished the south of Te Arai Point down towards Pakiri. There was fabulous fishing conditions, especially in the evening. We put out four sets of 10 hooks on the Big Dropper Rig and caught six snapper. We used salted mullet for bait and the wind was blowing from the west which made it easy to set the gear straight out. We sought permission from the ranger to drive through the forest road behind the sand dunes, and then turn onto the area above the beach. He obliged and we were off to our fishing spot. There was no-one else on the beach so we had no problems finding good clear fishing space. A reminder to those who wish to fish right next to someone who already has his kite out....go away. Overall, plenty of fish to eat, and a few to bring home. No lost gear (for a change), and a great time had by both grown ups and our sons. The forestry headquarters is a good sheltered camp with basic facilities, but at $7.50 per night, extremely good value. Ed: It is advisable to leave at least 500 metres between you and the next kitefisher on the beach, if you want to keep your gear clear of each other. Paul Morris, Pete Vesotolu and I met at Browns Bay, on Auckland's North Shore, for an evening fishing fest on Sunday 26th January. 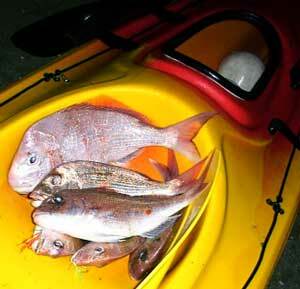 We set out in our kayaks and headed for an area south of the reef. We fished in about eight metres of water between 7pm and 10pm that night. The fishing started slowly with a few pan sized snapper but it improved as time went on. Snapper over 2.5kg were coming in on the later sets but Pete topped the chart with a 5kg beauty. The tide was low and turning which wasn't great but the setting sun helped with bringing the fish onto the bite. We had a 25 hook Boat Longline each and put the gear out three times. Out of the six sets done over the evening most were only down between five and ten minutes. We were using half pilchards for bait so that is why we only did short sets. I have been trying out the new Floating Bead traces and can confirm their effectiveness. Over 60% of the snapper were caught on these traces. I caught seven school snapper, Paul Morris caught a few schoolies and Pete caught a few smaller snapper to go with his 5kg fish. 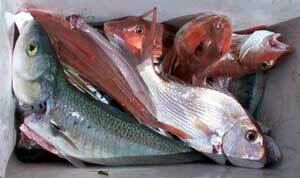 Left: Some of the catch of snapper from Browns Bay. We had a great trip over the bar of the Manukau Harbour in early January. Fishing from my boat we landed a couple of snapper, six gurnard and even a spotty shark. Tried setting the Boat Longline but it only came up with one large kahawai so we decided to concentrate on the rods. I used Target Snapper Hooks and re-snelled them with flasher material. I have tried this method before on the east and west coast and have had a lot of success. My crew caught one legal snapper while I hooked six large gurnard, a nice lemonfish and a 1.5kg snapper. 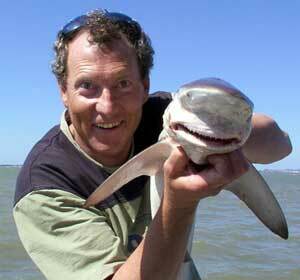 On another fishing trip inside the harbour early January I caught a little bronze whaler shark. This was caught using a Target Hook. The beauty of the hooks is that these little monsters don't get much of a chance to bit your trace. Our snapper and gurnard contests for the summer holidays are over. Greg Hart from Fielding won the snapper section. He takes away a Flexiwing Conversion Kit supplied by Paul's Fishing Kites. First prize in the gurnard contest has gone to Gary and Katrina Ellmers of Waipukurau. They have won an Okuma surfcasting rod and reel. Their winning fish was featured in last weeks newsletter and weighed 1.6kg. A very good sized gurnard. Hope to have photos next week. Attached is a photo of Gary and Sue Kemsley on Porangahau Beach Saturday 1st Feb 2003. They were here to test a new surf rod from Composite Developments that is due to be released for sale later this year. I took my Dropper Rig to Mairangi Bay on the North Shore just before the long weekend. I fished the southern end of beach and put out one set of 10 hooks. I landed two snapper, which was great. The wind was a moderate westerly so the gear didn't go out quite straight but it was a good wind for kite fishing. The tide was coming in and I baited my 4/0 Target Hooks with squid. A great way to catch dinner. To avoid the people on the beach we decided to get up at 4am on Monday last week. We baited the hooks at home so we had some light to work with and got to Red Beach, Whangaparaoa, at 5am. It was low tide and perfect for getting the 4WD on the beach as our power gear is rather heavy. We organised a battery to power some lights so we could get the gear ready. There was no wind for the kites so we decided to use the submarine. The submarine I have now is the third model I have built. I taped a small torch on top, shining back to the beach so we could keep a track of it. It went out about 600 metres and snagged so we pulled it back intending to start it again. During the retrieval the line broke and the submarine was adrift. All I needed early on Anniversary Day. The submarine has my name and phone number on it so I figured someone would find it and call me. We packed all the gear in the car just as dawn was breaking. It was a beautiful site and well worth the early start. Before we left the beach Maeve said she could see the submarine not too far out. She suggested I strip off and wade out to try to get it. So I took up the challenge! I was up to my chest in water but the sub was just out of reach. Fortunately every little wave brought it closer to me until I could reach it. It was between 5-6am and no-one was in sight until I reached the shore. A man walking his dog on the beach had stopped to talk to Maeve and wondered who this crazy bloke was walking out of the sea in his birthday suit with a long green tube across his middle. We were pleased to have the gear back but didn't have any more bait to use so we headed for home. I was back in bed by 7am. Not bad for an 81 year old. We tried rod fishing in the Manukau last weekend and caught some beautiful fish. We caught some good sized trevally, snapper up to 40cm, kahawai and other species. Using the 4/0 Target Hooks works the best out there. I take the 22kg trace off the hook and replace it with 8kg. This tends to be more successful for catching trevally as most of the time they are quite shy of heavier snapper gear when taking the baits. Using shellfish baits has been the recipe for us, pipis are good. Mussels do not seem to be as successful, down our end of the harbour at least. Fishing not far from Laingholm we had some good hits and the fish were on the bite as soon as we arrived at our fishing spot. The harbour is alive with fish at the moment, there are fish leaping out of the water, kahawai chasing sprats and mullet on the banks. Gurnard are still being caught in some places around the harbour. There are lots of stingrays and eagle rays as well, if you interested in targeting them. A good sized kingfish, around 15kg, was caught not far from Laingholm on Saturday. I never saw the fish but according to reports it was in good condition. The kingfish was caught by a fisherman in a boat that was drifting on the edge of the channel.